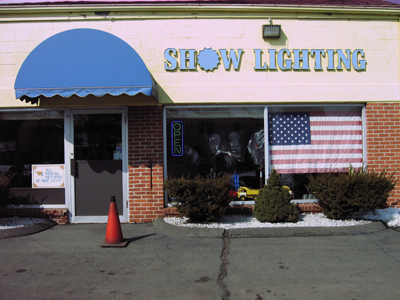 Show Lighting, Corp. is a full service lighting supplier offering rentals, sales, and service to the concert, stage, film, and television industries since 1956. We are located at 20 Willard Avenue, Berlin Connecticut 06037-2240. Lighting, rigging, special effects, power distribution, portable generators and followspots are just some of the services we provide. We offer complete lighting design and production serving the arts, education, industry, and special events. From the initial concept to the installed product we can satisfy your lighting needs. We service all aspects of the professional lighting industry. From the rental of a few lights to a full scale production with intelligent lights, LED's and fiber-optic backdrops. Whether it's lighting design and CAD plotting with WYSIWYG software, equipment rental and labor to install a one of a kind show. To consultation and permanent installation in performing arts venues and museums. Show Lighting can provide the gear, know-how and man power to handle your lighting needs. We offer complete temporary power distribution services. From generators and transformers to cable and circuit breaker protected branch distribution. Show Lighting has the equipment and the expertise to get power where you need it. Our generators are Blimped for quiet operation with electronic governor-controls. Trailer mounted with ground package. Power distribution services are also available. Operators available. Call us for various generator sizes. Show Lighting has been the source for energy and lighting for . . .